Inside Out Window Washing, Inc. is a premier locally owned and operated complete service cleaning company that has been servicing residential homes and commercial buildings in Jacksonville, Florida and all surrounding areas since 2003. We provide interior and exterior window washing, janitorial services, home and building maintenance and repair, and pressure washing with first class customer service to Northeast Florida from Ortega to Ponte Vedra and St. Augustine to Amelia Island. 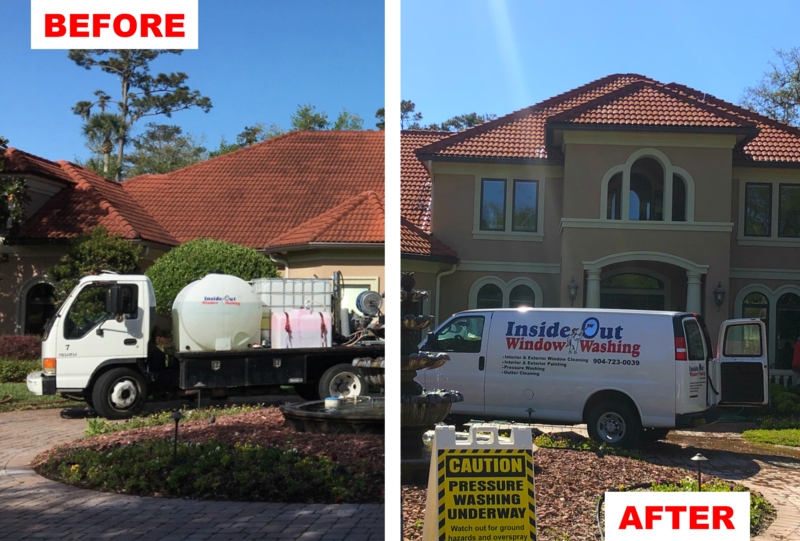 Inside Out is the sole provider of window cleaning, pressure washing, janitorial services, maintenance and repair for multiple Jacksonville businesses, including the Ponte Vedra Inn and Club, Goodyear, along with many others. Just tell us what you would like to do to improve the appearance or function of your home or business from roof to floor, from the windows to the walls, and we will be happy to help you. Inside Out Window Washing, Inc. prides ourselves on our top rated customer service. We strive to exceed our customers’ expectations and go above and beyond to take care of you. Inside Out’s cleaners are extremely mindful of our customer’s property. We work quickly and quietly to ensure your home or business is not disturbed and is cleaner and safer when we leave. The safety of our customers, customer’s property, and employees is a top priority. Even with all the soap and water, Inside Out has never had an insurance claim filed nor have we ever had an injury on the work site, a rarity in our industry. We are licensed and insured for all jobs big or small. Let Inside Out take care of those pesky home projects that you don’t have time to get off the to-do list or the jobs too large for you to handle yourself, so you can enjoy your spare time and home with your family. Contact us by the email form or call us at (904) 723-0039 to schedule an appointment or a FREE estimate today!